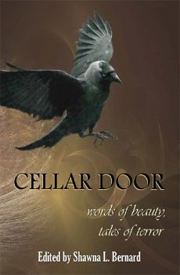 Cellar Door is an anthology of poetry, flash fiction, short stories, and visual art that all revolves around one common theme; the cellar door. Not just any cellar door, but the cellar door that we all knew as kids growing up. The one that always made you feel a little uncomfortable but that held such terrifying intrigue. The one where you made sure to watch over your shoulder as you turned your back to it. It’s the archetype of the cellar door that is seemingly so engrained in our minds and imaginations that has come to inspire each and every piece in this collection. Edited by Shawna L. Bernard and published by James Ward Kirk Publishing, this anthology is one of huge volume and contains dozens and dozens of pieces to get lost in, and at first glance upon the subject matter it may seem as though the theme may become a little redundant, but rest assured, this is certainly not the case. Poems and short fiction that are included vary so much in voice, style, aesthetic, and even the use of the theme of the cellar door are so well implemented, that time and time again you are pleasantly surprised at the creativity and pure originality of each piece and each author. Influences ranging from Edgar Allen Poe to Stephen King are all present and it is really neat to compare and contrast each piece. Flipping to any random entry will surely draw you in and soon enough, you yourself will be conjuring up your own ideas and stories about cellar doors. Each story will harken you back to a time where that aging frame and rustic door handle sent chills down spine. The diversity that can be found in Cellar Door is great and it is so easy to just get lost in a quick story or two when you may not have enough time to fully lose yourself in a novel. This entry was posted in Blog, Book Reviews, Reviews and tagged Anthology, Cellar Door, Childhood Fears, James Ward Kirk Publishing, Shawna L. Bernard, Short Stories. Bookmark the permalink.